هدف کلی این پژوهش، بررسی اثرات خدمات دفاتر فنّاوری اطلاعات و ارتباطات روستایی (ICT) بر مؤلفه‌های سرمایة اجتماعی روستائیان است. این تحقیق، توصیفیـ پیمایشی بوده و با استفاده از شیوة نمونه‌گیری تصادفی ساده انجام‌شده است. جامعة آماری تحقیق روستائیان روستای گودین شهرستان کنگاور واقع در استان کرمانشاه است. حجم نمونه با استفاده از جدول کرجسی و مورگان، 351 نفر تعیین شد اما نرخ بازگشت پرسش‌نامه‌های توزیع‌شده در این جامعة آماری 254 عدد بود. براساس یافته‌های تحقیق سطح سرمایة اجتماعی روستائیان بررسی شده در حد متوسط بود. همچنین اختلاف معنی‌داری بین میزان سرمایة اجتماعی کاربران و غیرکاربران خدمات دفاتر فنّاوری اطلاعات و ارتباطات روستایی مشاهده شد. 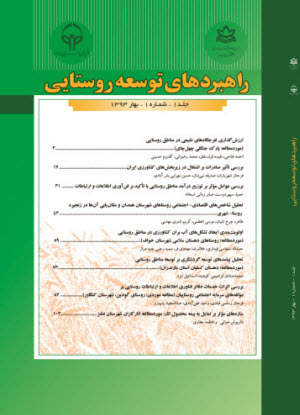 دسترسی به خدمات دفاتر فنّاوری اطلاعات و ارتباطات روستایی، ازجمله دسترسی به اینترنت ، منجر به پذیرش بهتر تفاوت‌ها در افراد شده و این افراد در اجتماع محلی مشارکت بیشتری دارند. با توجه به این نتایج پیشنهاد می‌شود با گسترش زیرساخت‌های لازم و ترغیب روستائیان در استفاده از این فنّاوری‌ها، زمینة توسعة سطح سرمایة اجتماعی آن‌ها و موفقیت در برنامه‌های توسعة روستایی فراهم شود. The main purpose of this study is to investigate effects of rural ICT office services on developing rural social capital. It’s a descriptive-conductive study using simple random sampling. The population society are peasants of Godin village in Kangavar county of Kermanshah province. The sample size using Morgan and Krejcie table was determined 350 but the rate of return was 254 questionnaires. Results showed there was significant difference a bout level of social capital between user and non-user ICT's services. Access to ICT services in rural offices, including access to the Internet can lead to better acceptance of differences and these people were more involved in community and have more participatory in community. Based on these results it is proposed to develop the necessary infrastructure and encourage peasants in using this technology for the development of social capital and to success in rural development programs. ازکیا م. و فیروزآبادی س (1383) سرمایۀ اجتماعی و نقش آن در تشکل­های تولیدی: مطالعۀ موردی حوزه آبریز کرخه. جامعه‌شناسی ایران. 5: 54-45. آمارنامه مدیریت جهاد کشاورزی شهرستان کنگاور. خرداد 1389. پاتنام ر (1380) دموکراسی و سنت‌های مدنی، ترجمۀ محمدتقی دلفروز. تهران: انتشارات غدیر. ذکایی م. و روشن فکر س (1385) رابطۀ سرمایۀ اجتماعی و کیفیت زندگی در محلات شهری. علوم اجتماعی. 32: 45-38. سالارزاده ن. و حسن‌زاده د (1385) بررسی تأثیر میزان سرمایۀ اجتماعی بر رضایت شغلی معلمان. علوم اجتماعی. 33: 45-39. صدیق بنای ه (1387) رسانه‌های جمعی و سرمایۀ اجتماعی. تهران: اینترنتی آفتاب. تاج‌بخش ک (1382) بررسی مقدماتی کاربرد نظریه سرمایة اجتماعی در تحلیل وضعیت سرمایة اجتماعی در ایران. تأمین اجتماعی. 16: 232-224. رجب‌زاده ا (1382) رفتارهای فرهنگی ایرانیان. وزارت فرهنگ و ارشاد اسلامی. دفتر طرح‌های ملی. رستمی ح (1388). تعاون و سرمایة اجتماعی، انتشارات فرهنگ دهخدا، (به سفارش) وزارت تعاون. چاپ اول. قلی نیا م. ج و یعقوبی ا (1388) تحلیل نقاط قوت، ضعف، فرصت‌ها و تهدیدهای توسعه ICT روستایی و دفتر خدمات‌رسانی در ایران. مجموعه مقالات همایش خدمات فنّاوری اطلاعات و ارتباطات روستایی. کمالی ا (1383) مطالعه تطبیقی اعتماد اجتماعی در دو حوزه فرهنگ و سیاست با تأکید بر سازمان‌های تخصصی. رساله دکتری جامعه‌شناسی دانشکده علوم اجتماعی تهران.87-24. مطیعی لنگرودی س. ح. و رضوانی م. ر (1389) تحلیل اثرات اجتماعی و اقتصادی فنّاوری اطلاعات و ارتباطات روستایی (مطالعه موردی: بخش مرکزی شهرستان گرگان). جغرافیا، 26: 59-33. منتظرقائم م. و عبدالعزیز ت (1384) اینترنت، سرمایة اجتماعی و گروه‌های خاموش. انجمن ایرانی مطالعات فرهنگی و ارتباطات. 46: 244-24. موسوی خامنه م (1383) سرمایة اجتماعی و سلوک اجتماعی (پیامدهای مدنی سرمایة اجتماعی در مدارس). رساله دکتری جامعه‌شناسی دانشکده علوم اجتماعی تهران. 80-20. میرزاخانی ب (1380) رابطه سرمایة اجتماعی و فرهنگی با نگرش به رشته تحصیلی و عملکرد تحصیلی. دانشکده علوم اجتماعی تبریز. یزدان پناه ل (1382) بررسی عوامل مؤثر بر میزان مشارکت اجتماعی شهروندان هیجده سال و بالاتر شهر تهران. رساله دکتری جامعه‌شناسی دانشگاه علامه طباطبایی.96-25. Alonge J. A (2002) Traditional Institutions, social capital and multi-institutional partnerships for agricultural development: implications for anew extension paradigm. AIAEE. Proceedings of the 18 th anual conference. Durban. South Africa. 8-11. Blanchard A. and Horan T (2000) Virtual communities and social capital. Social dimensions of information technology: issues for the new millennium. Hershey, PA, USA, Idea Group Publishing. 12: 6-21. Bullen P. and Onyx J (2000) measuring social capital in fire communities. Applied behavioral science. 36: 23-42. Coleman (2005) The influence of social on sustainable agriculture in marginal areas, kenya: a case study of mach akos and taita- taveta districts. Telemetric and informatics.45: 213-215. Ferlander S (2003) The Internet, social capital and local community. Sterling, University of Sterling. Available at: http://www.crdlt.stir.ac.uk/Docs/SaraFerlanderPhD. 2: 25-31. Gangadharappa N. R., Acker D. G., Chengappa P. G., Ganesamoorthi S., Kumar S., Sajeer M. V. and Shen D (2007) Social capital and ability change among indian farmers.www.AIAEE.org /attachment. 14.2. Glaeser E. L (2001) The formation of social capital, organization for economic co-oration and development. www. ecd.org/dataoecd/5/17/1824983. Hargittai E (2004) Internet Access and Use in Context. Journal of New Media Society. 6(1):134-143. Krejcie R. V. and Morgan D. W (1970) Determining sample size for research activities. educational and psychological measurement. 30: 607-610. Lin N (2001) Building a network theory of social capital, connections. New Media Society. 22(1): 28-51. Leung L. and Lee P (2004) Multiple determinate of life quality: the role of internet activities, use of new media, social support, and leisure activities. Telemetric and informatics. 27: 113-207. Patrick S., Field J. and Falk L (2003) Social Capital: an analytical tool for exploring lifelong learning and community development. British Educational Research Journal. 29: 417-435. Portes A (1998) Social capital: its origins and applications in modern sociology. Annual revive of sociology. 24: 1-24. Putnam R (2000) the prosperous community: social capital and public life. The American prospect. 4: 35-42. Smith M. B. and Sharp S. I (2003) Social capital and farming at the rural- urban interface: the importance of non farmer and farmer relation. Agricultural systems. 76: 913-927. Williams J., Wallace C. and Sligo F (2005) Free internet as agent of community transformation. The Journal of Community Informatics 2: 37-46. Woolcock M. and Narayan D (2000) Social capital: implications for development theory, research, and policy. World Bank research observer. 15 :25-49.